Each year at the Fellowship of Grace Brethren Churches annual conference, the Association of Grace Brethren Ministers honors three of its number for their excellence and longevity in ministry. 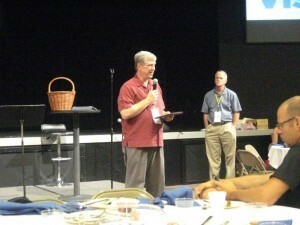 AGBM president Joel Richards announced the awards during the conference this past week. Pastor Keith Shearer of the New Beginnings Grace Brethren Church in Myerstown, Pennsylvania, was honored as the Pastor of the Year. 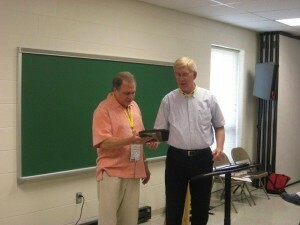 The citation was read by Dan Jackson of the New Beginnings staff noting, among other things, that Shearer has not only distinguished himself as a pastor but also has significant service with the Grace Brethren International Mission board (chair),with adjunct teaching at Grace Theological Seminary, and other ministry opportunities. Dave Guiles was presented the excellence award by Steve Bailey of GBIM. The Excellence in Ministry award was given to David Guiles, executive director of Grace Brethren International Missions. Guiles, who is the son of a Grace Brethren pastor and who is a former missionary to Argentina with GBIM, has been leading the organization for the past decade and is currently involved in leading the mission agency to a number of innovative and adaptive steps to enhance its ministry and impact into the future. 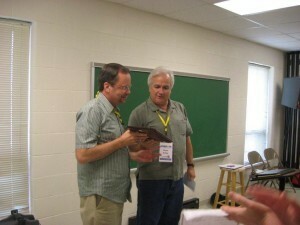 Don Shoemaker (left) was presented the award by Dr. John Teevan.